Expected to be out in April 2018 at The MIT Press. Research shows that all humans have a predisposition for music, just as they do for language. All of us can perceive and enjoy music, even if we can’t carry a tune and consider ourselves “unmusical.” This volume offers interdisciplinary perspectives on the capacity to perceive, appreciate, and make music. Scholars from biology, musicology, neurology, genetics, computer science, anthropology, psychology, and other fields consider what music is for and why every human culture has it; whether musicality is a uniquely human capacity; and what biological and cognitive mechanisms underlie it. 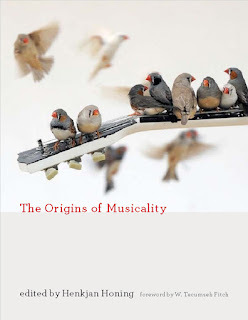 Contributors outline a research program in musicality, and discuss issues in studying the evolution of music; consider principles, constraints, and theories of origins; review musicality from cross-cultural, cross-species, and cross-domain perspectives; discuss the computational modeling of animal song and creativity; and offer a historical context for the study of musicality. The volume aims to identify the basic neurocognitive mechanisms that constitute musicality (and effective ways to study these in human and nonhuman animals) and to develop a method for analyzing musical phenotypes that point to the biological basis of musicality. Jorge L. Armony, Judith Becker, Simon E. Fisher, W. Tecumseh Fitch, Bruno Gingras, Jessica Grahn, Yuko Hattori, Marisa Hoeschele, Henkjan Honing, David Huron, Dieuwke Hupkes, Yukiko Kikuchi, Julia Kursell, Marie-Élaine Lagrois, Hugo Merchant, Björn Merker, Iain Morley, Aniruddh D. Patel, Isabelle Peretz, Martin Rohrmeier, Constance Scharff, Carel ten Cate, Laurel J. Trainor, Sandra E. Trehub, Peter Tyack, Dominique Vuvan, Geraint Wiggins, Willem Zuidema. Interested in doing a Masters in Amsterdam? ©2006-2018 MCG. Powered by Blogger.